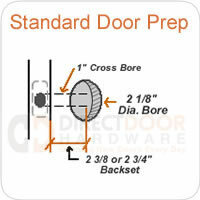 Double Cylinder Deadbolts are generally used in combination with a keyed door knob or lever handle on exterior doors. Double cylinder deadbolts are locked or unlocked on both sides with a key. This is a good option for doors with glass in them as an intruder could not unlock the door even if the glass was broken. This option is not recommended for most exterior doors because if there is an emergency, occupants would have to search for a key before being able to escape.